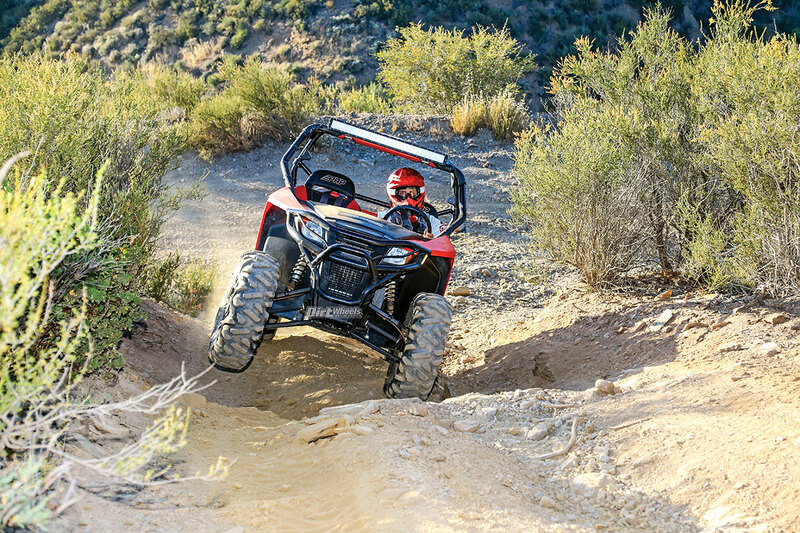 All 50-inch UTVs are happiest when you turn off the fast fire roads and onto narrower, more technical trails. The Wildcat Trail works better than a stock one in fast and rough conditions. 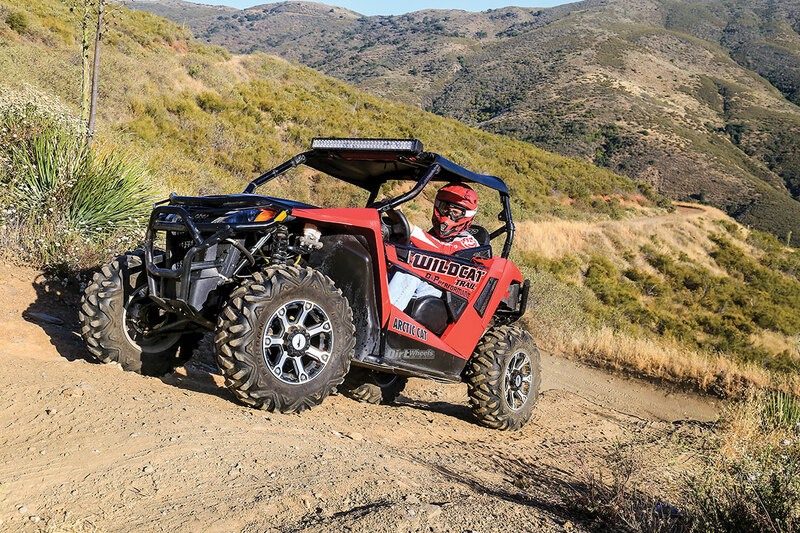 All 50-inch UTVs are happiest when you turn off the fast fire roads and onto narrower, more technical trails. 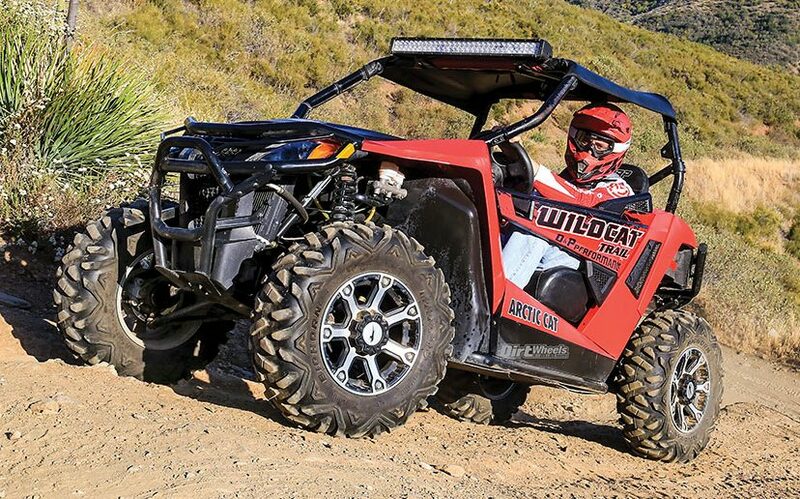 This Wildcat Trail works better than a stock one in fast and rough conditions. This could be the lowest-budget UTV project that we have ever covered in Dirt Wheels. Derek Hunt and his brother Chris spend their days creating incredibly exotic electric bikes for their company, Hi-Power Cycles (www.hi-powercycles.com). Don’t tell anyone, but despite their penchant for things electric, the brothers harbor a fondness for things powered by gasoline. Very few of their high-end electric bikes cost less than what Derek forked out for this bargain with 400 miles on it. Marital strife put this baby on the block, and the price had Derek out in the driveway with a tape measure. 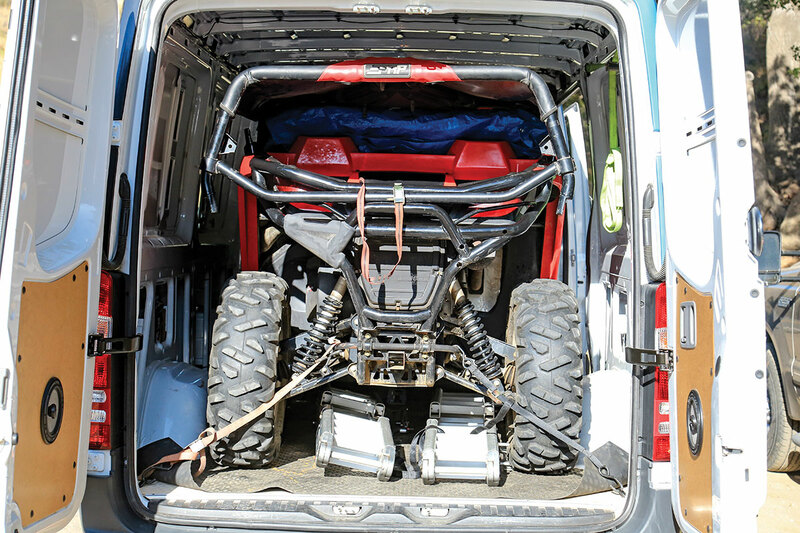 He checked the specs of the Wildcat Trail online and measured every corner of his Sprinter van, then he was off to Arizona with his fingers crossed but no guarantee that the Wildcat Trail 700 would actually fit in his van! A van, by the way, without a tow hitch, so there would be no renting a trailer to get the Trail home. 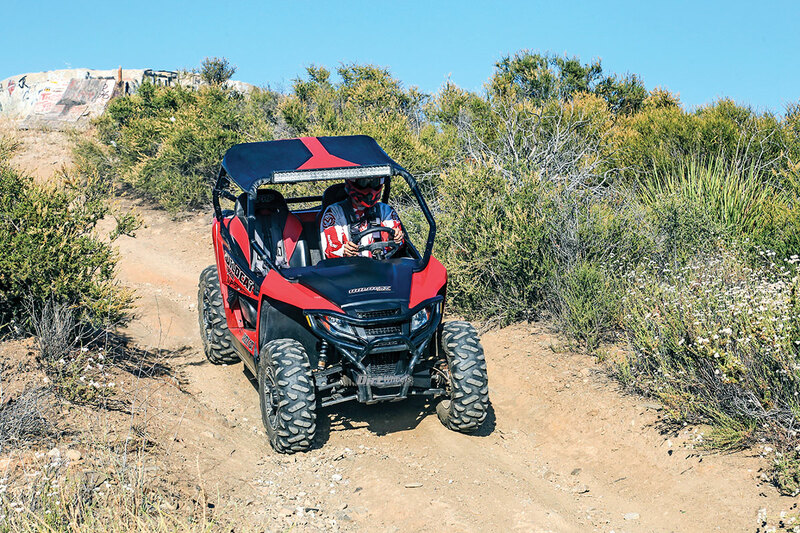 For a nimble, short-wheelbase car, this Wildcat Trail proved to be an able tool for technical climbs. Apparently, youth and confidence are great things. 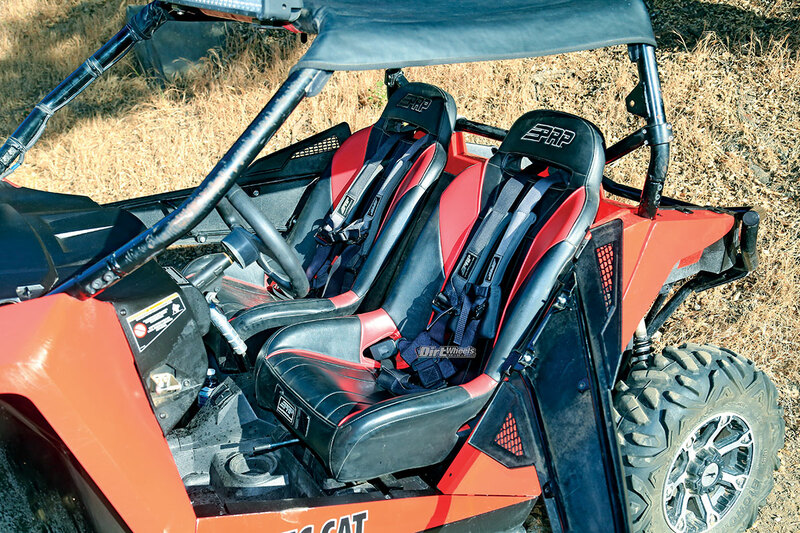 He made the deal, and his engineer’s mind opted to lower the air pressure in the tires until the smallish sport UTV slid snuggly into his van. Score! A Wildcat Trail 700 might seem an unusual choice here. His brother owns a high-revving, need-for-speed Yamaha YXZ1000R, and Derek is 6-foot-3. Plus, he lives in California where most drivers feel that a UTV can’t be too wide, too fast or have too much wheel travel. He explained that he finds the Wildcat Trail cockpit very comfortable, and he likes driving in the trees. He is willing to drive to find those trees. At times, that means trekking all the way to Utah. 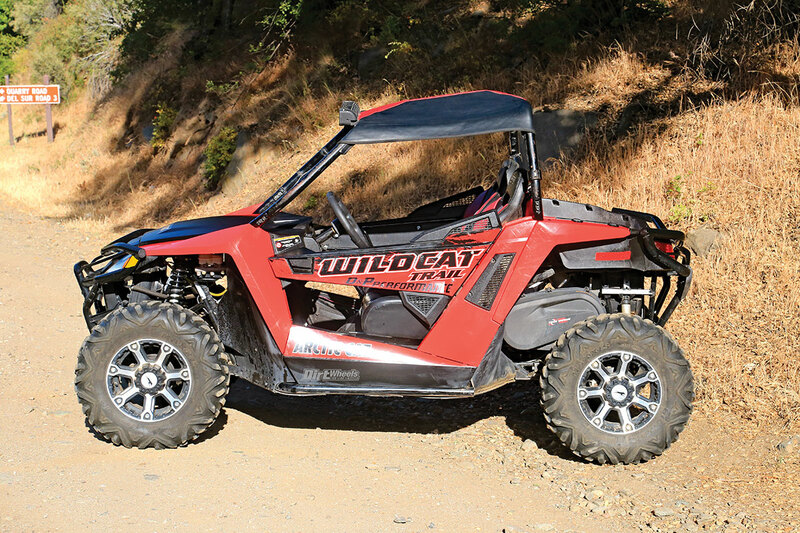 With 29-inch tires and stiffer springs, Derek Hunt’s Wildcat Trail 700 descends with much better control than the stock machine. The PRP soft top has good coverage without a lot of weight. Fortunately, the previous owner had made a number of common and desirable upgrades to the Trail. It has PRP seats and four-point seat belts installed. PRP also sewed up a vinyl sun top for the machine. 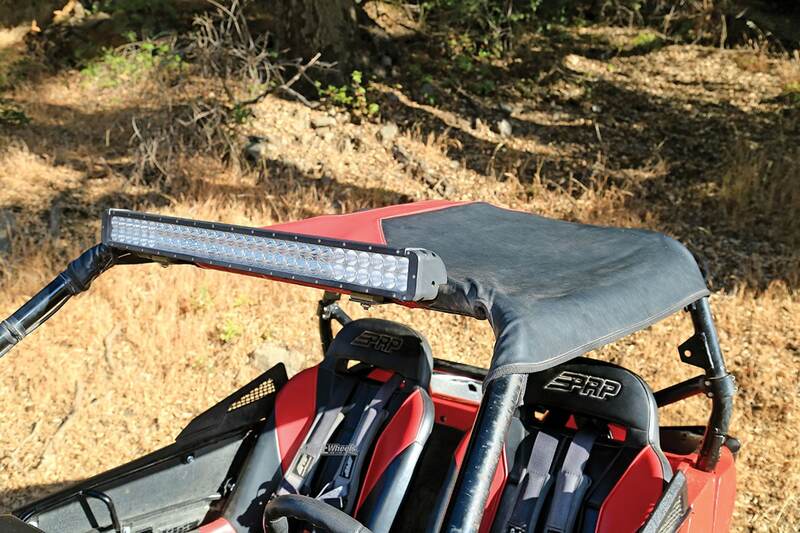 A full-width LED light bar is mounted to the front of the stock cage, but it is of unknown origin. The machine was also upgraded to 29-inch Maxxis Bighorn tires from the 27-inch stock tires. As far as Derek knows, the clutching and engine are all stock. Any 50-inch car has limited suspension travel. There simply isn’t enough room in 50 inches to give the A-arms the room they need for long travel. Derek states that the suspension was far too soft when he bought the Wildcat. He upgraded the stock springs to a kit from Bandit UTV Suspension in Michigan. Bandit was the only company that Derek could find. Bandit confirms that as far as they know, they are the only company. They also make fully adjustable piggyback shocks for the Trail, and all four are under $1200! The stiffer springs on the stock shocks make a big difference, and the 29-inch tires help as well. The tires have more sidewall for tire suspension, and the larger circumference lets the tires roll across bumps more easily. Frankly, for California, we prefer the wider, longer-travel Wildcat Sport 700, but we must admit that the changes to this 50-inch car have made a large difference. Fast turns are not the most comfortable thing to do in a 50-inch car. The stiffer springs help, but the taller tires don’t help here. They do add welcome clearance, though. Inside the Wildcat the PRP seats and belts are an impressive improvement. We were curious why someone would choose to spend that much on seats for what is pretty much a base model, but the comfort speaks for itself. We also like the soft sun top. It cleans up easily, and it keeps the elements away from the occupants without adding a bunch of weight to a small car. We have to say that the PRP seat belts are nice as well. They adjust easily yet hold you securely and safely in the PRP seats. Derek isn’t sure if there will be further mods for the Wildcat, but meanwhile, he is spending his time looking for places that he can drive it in the trees somewhere. For now, the intake, EFI and exhaust are all stock. Despite the 2-inch-taller tires, performance is good. The Wildcat is very spunky for a 700cc twin. By staying with the stock rims, and thus the stock offset, the car handles normally (and fits in the van). It does have notably better ground clearance with the taller tires. Hunt found that the stock suspension was far too soft. 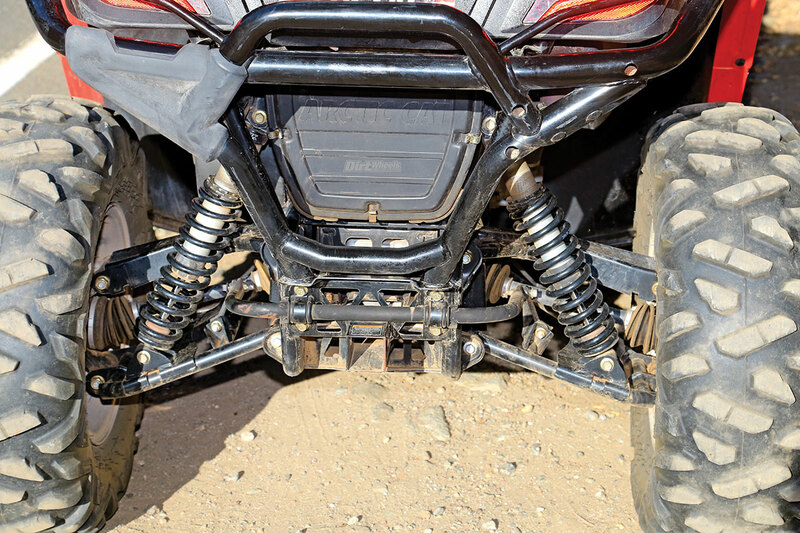 It would bottom braking on steep downhills, so he opted for a spring kit from Bandit UTV Suspension. Derek rolled up to our riding spot, and we were surprised to see that the Sprinter wasn’t the high-top model. He opened the back doors, and the Trail fit snuggly but functionally inside. He has refined the technique, and he leaves the tire pressure alone but removes the roll cage. With a cordless impact gun, it is faster to remove and replace the cage than to mess with the tire pressure! We watched (and helped a little) as he installed the cage. It is indeed a painless process. The cage almost bayonets together, so it would be difficult with one person but easy with two. You probably don’t arrive at your riding area like this, right? Derek Hunt finds driving without a trailer to be a very pleasant way to go riding. With the machine once again safe to drive, our 6-foot-plus staffer piled in with Derek and we hit the trail. 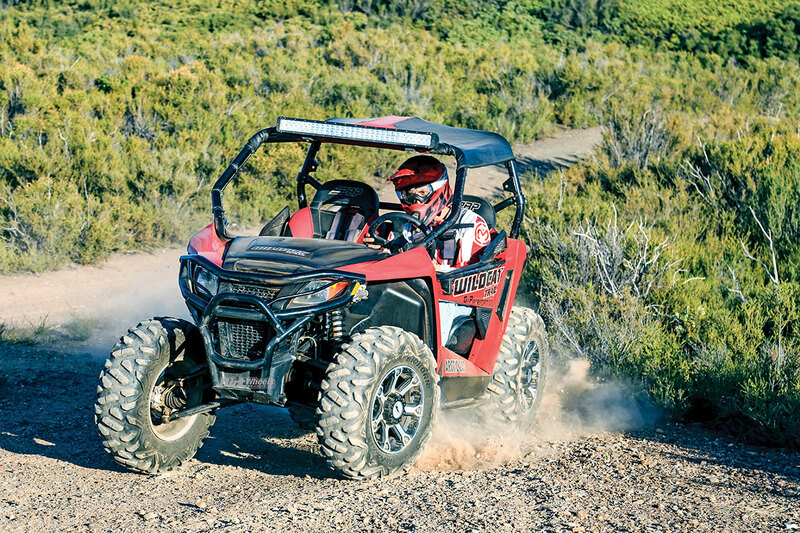 Even with two big guys inside, the Trail 700 is a zippy performer that accelerates hard. Perhaps more importantly for a 50-inch car and the trail conditions they would be expected to tackle, the response is instant yet smooth and tractable right off idle. No doubt the taller tires made a difference in low-speed response. A light bar of unknown origin and a soft top make night, sunny or rainy days more pleasant. Derek warned that he was comfortable with the suspension but was cautious on cambers. That is only prudent in a 50-inch car. When he bought the car, it showed clear evidence on the cage that it had been on its sides. In reality, we found that he was pretty confident on cambers. Our trails have some narrow areas with humps at the trail sides that lean cars pretty well, but the 50-inch car could mostly avoid the angles. 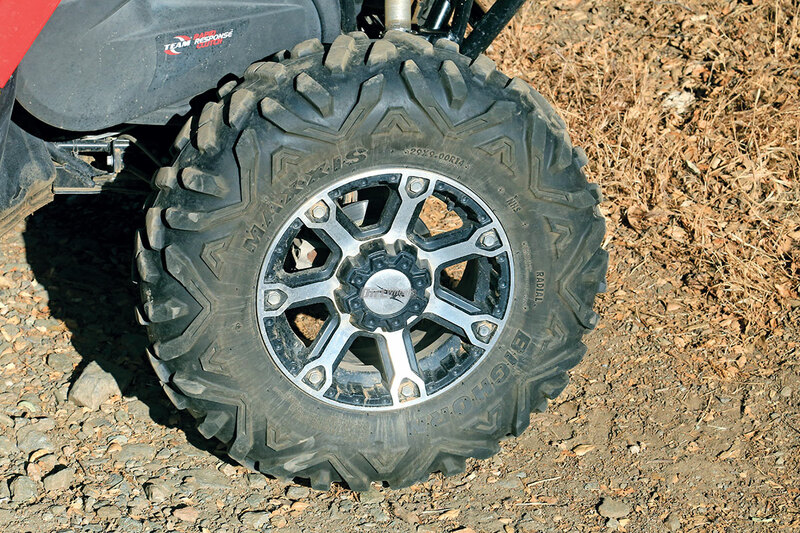 The Wildcat Trail comes stock with 27-inch tires, but this car runs 29-inch Maxxis Bighorns all the way around for added clearance and rolling diameter. While we were testing this machine, it stayed in a pack with a Polaris RZR XP 1000 4 and his brother’s YXZ1000R with little trouble. We didn’t feel like we were getting punished by the suspension. For certain there are areas of SoCal that we would avoid in a 50-inch machine, but there are plenty of areas where a 50-inch car setup like this one will be a load of fun. And in this case, the price of fun is a true bargain. Derek Hunt makes a living with powerful electric bikes at Hi-Power Cycles, which he co-owns with his brother Chris. Both of them like driving UTVs off-road.